Background: Foster children are at higher risk of the development of behavior and emotional problems, which can contribute to the development of insecure attachment bonds with their foster parents and (subsequently) to placement breakdown. Sensitive parenting might minimize the adverse effects of the behavior and emotional problems. Video-feedback Intervention to promote Positive Parenting and Sensitive Discipline in Foster Care (VIPP-FC) is an adaptation of the evidence-based Video-feedback Intervention to promote Positive Parenting and Sensitive Discipline (VIPP-SD) and aims at increasing sensitive parenting and the use of sensitive discipline strategies of foster parents. The current study is the first to examine the effectiveness of VIPP-FC. Methods: A randomized controlled trial is used with 60 foster parent-child dyads (intervention group n=30, control group n=30). The primary outcomes are parental sensitivity, parental disciplining, and parental attitudes towards parenting. Data about attachment (in)security, behavioral and emotional problems, neurobiological parameters, and possible confounders is additionally collected. 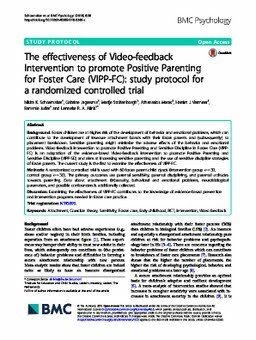 Discussion: Examining the effectiveness of VIPP-FC contributes to the knowledge of evidence-based prevention and intervention programs needed in foster care practice.